"One reason for the refusal to accept the reality of climate change is what is called “motivated interference,” ..... this can include a general unease with large government projects that are expensive and interfere with individuals’ lives." I dont see hard evidence of general unease. The majority accept social security programmes, pensions, governments owning some infrastructure so why would climate programmes be different? The unease seems more to be with some small government leaning groups and businesses with a particularly hard line attitude. "We can grasp a potential calamity if we know it is made up and will be okay in an hour and a half. But we resist when that calamity is real, will be spread out over decades, and is of catastrophic proportions that can only be averted if we change almost everything about the way we live. Stop driving your car, eating meat, and flying in planes, we are told. " We are not being asked to change almost everything about how we live or to stop driving our cars etc. We are being asked to make commonsense and moderate cut backs to consumption. 1) We do resist action if the calamity is real and spread over decades, but this is because we are genetically programmed to respond to short terms threats rather than long term threats. Our adrenal system kicks in more with short to medium term threats, so we may intellectually conceptualise long term threats but our motivational system is effectively asleep. However imho awareness of this problem is how we can combat the problem. 2) I think it's a leadership issue ultimately. Human beings are followers. Governments need to lead and only governments and business can create a modern renewable energy grid. People might feel there is not huge point individuals making huge sacrifices until governments get these basics right and look like they mean business, and so far transforming the grid has been very slow. Yes of course we as individuals can and should do all we can to reduce our carbon footprints as well, and not wait for other people and governments to move, but its important to understand the dynamics that are driving the whole issue, and see it in context. 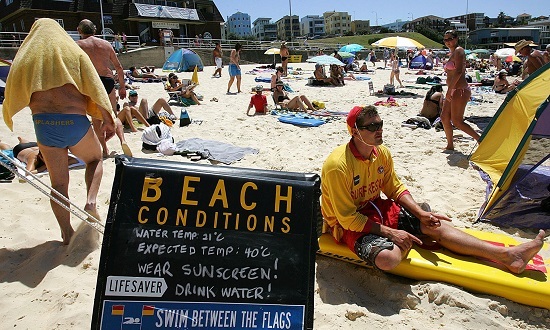 In Australia, a series of heatwaves have pushed land surface temperatures to new highs. A consequence of this in western NSW has been that the water temperature of the Menindee Lakes has risen which, combined with an algae bloom and lack of water flow due to drought and maladministration, caused oxygen levels in the water to plummet. The result: over a million fish died. A lot of excuses and pious words from politicians and water consumers but the devastation is ongoing as successive heatwaves in summer produce new record highs. This time its only fish casualties. Future temperature rises could produce human fatalities. That might jog government into doing something about global warming. Nothing else seems to have worked. I just have to point out that at the same time it is now 14 degrees F in Manchester NH with sleet and freezing rain. Which pretty much should be impossible, but here it is. It is going to be like that all day across much of New Hampshire. Maybe all this is just bad weather. What would global environmental collapse look like anyway? The map below shows temperature from November so a couple of month's old. (A more recent version is delayed, likely because of that tantrum from the child on Pennsylvania Ave.) Yet, despite Nov 2018 being the =5th warmest November on record, the NE US is looking decidedly chilly (as it also had in October 2018). From what you say, it will still be in place in January but is that anything more than weather? How does it compare with past cold winters? I ran into these two posts over at RealClimate. It appears that Dr. Ray Bates needs to be added to the list of climate misinformers. A rebuttal filled with debunked science is standard fare for the denialist community but attacking an investigation (that cleared the scientist who was attacked with false accusations) that was under your own leadership without disclosing this little fact is a level of mendacity that should disquality him from ever being allowed any near respectable institution involved in science. Australia bakes and they still burn coal instead of using solar panels. Perhaps lying around on the beach has cooked their brains. Sunspot, you say "Which pretty much should be impossible, but here it is". Why do you say that? Why should it be impossible? I didn't think rain could form and fall at subzero temperatures. I'm not a physics expert by a long way, but this seems self evident. So perhaps Manchester just had a thin layer of sub zero air near the ground, and the rain shot straight through this? OK, I see - 14F didnt mean much to me, but -10C makes it clear. Ed Hummel gives a pretty useful explanation here. NigelJ is right. Freezing rain happens when there is a temperature inversion, which is common when a warm front overtakes a cold air mass in the winter. It often starts with snow, then sleet, followed by freezing rain. It obviously indicates that the temperature at higher altitude is above freezing. I certainly would not believe that this is an impossibility anywhere in NH, nor is a temperature of -10 degrees C.
The average low for January in Manchester is 12 degrees Farenheit, lower than the temperature of this event according to Sunspot. Nothingburger. Just another example of "it snowed so there is no global warming" nonsense. I wasn't born yesterday. I have never seen anything like sleet at 14 degrees. When it is that cold - it snows!. Every time! Yes, of course, there was a warm layer meltng the precipitation on the way down. I get that. And I certainly did not say that it was 'impossible". Obviously not. And anyone paying attention to the weather yesterday knows that this was not just in Manchester, NH, it was a widespread phenomenon all over the Northeast. Very low temps, but still sleet or even freezing rain. Not impossible, but very, very unusual. I'd bet that, if you showed what happened yesterday to any meteorologist thirty years ago, they would have said that storm was so unlikely as to be nearly impossible. Nearly. @MA Roger - Great map. One day. One day is weather. Climate is not shown on a map of one day's weather. The cold air detaching from the Pole to this extent and remaining so far south for so long, and how frequently this sort of thing is happening in the past couple of decades, is an obvious consequence of Global Warming. Sure looks like a major slowdown in the thermohaline circulation to me. The question I was trying to ask was: If the Global Environment was collapsing before our very eyes, what would we be seeing? In other words - explain to me how what we are seeing is NOT ongoing Global Environmental collapse? Because I think that it is. And it is accelerating. The simple fact that 75% of the insect population has died off provides strong evidence right there. Here's the thing - IPCC says we have twelve years left. They don't specify what that really means. Wise. I say they are overly optimistic, and I maintain evidence is "on my side". I feel like I know too much. I just go along with my day, but I think it is highly likely that the humans don't have much time left. And honestly, I don't talk about it because the last thing I want is for people to understand that the way I understand it. I claim no superior mental stability, but I know most people can't handle the concept that most life can be extinguished on this planet within a few years. Let's be kind and say a decade. I don't want people to know that. Enjoy what time is left. My only suggestion is this: if there is something on your bucket list you are planning for five years from now, and you can do it next year, move up your plans. [DB] Promoting doom (snipped) is unhelpful. The GISTEMP graphic @4 is a month's average not a single day. Were there no budget dispute running in the US, I would consider examining US state temperature data to see how unusual this East Coast cold spot actually is, but the child on Pennsylvania Ave is still in tantrum mode & NOAA data is off-line. As for your question which I paraphrase - 'What would we be seeing if Global Environmental collapse were happening?' That would likely depend on what you mean by "Global Environmental collapse." And while you insist The IPCC "don't specify what (twelve years left) really means," the IPCC SR15 does make clear what it expects in 12 years - a 45% cut in carbon emissions relative to 2010. And this is required, they say, to "limit warming to 1.5°C" and provide analysis of what exceeding such a warming would result in. Clearly Manchester had some sort of rather large temperature inversion. Either snow hit a warm layer and turned to rain or rain passed through a shallow cold layer before it had time to freeze completely. The thing is would climate change be making temperature inversions worse in some way? Turns out climate change is expected to increase the occurence of temperature inversions.. and here as well. Just a bit of Sherlock Holmes searching on my part. So Sunspot might have been onto something. OK, I was dead wrong in my hasty interpretation of sunspot underlying message, I guess I'm a little jaded from years of fending denier's BS. Apology for that. However, I was not wrong in my assessment of how unusual this is for NH; it's not. Sunspot said verbatim at post #3 above "should be impossible." There is absolutely no reason why it should be impossible and it certainly is not uncommon. Changnon et Karl (2003) mapped the frequency of freezing precipitation for the 48 contiguous for the perio 1948-2000. Only Southern Cal and Southwestern Arizona have an average frequency of freezing precipitation days of zero. See link above, for some reason, it would not insert anywhere but at the top of the page. PC @14, there is so much denialism about, that its easy to jump to conclusions, and I do it as well. We get on edge. You are right, the event is not unusual, however it does look like inversions will become more frequent as in the links I posted. Is there a difference between 'catastrophe' and 'doom'? I try to constantly improve my awareness and understanding. My current developed understanding is that the Objective of human activity needs to be helping others. With the highest level of that objective being to sustainably improve the future for humanity. The flip side of that understanding is that, as a minimum, people need to avoid harming others, including and especially not harming the future of humanity. The Sustainable Development Goals, particularly Climate Action, are a great presentation of what is required to achieve a better future for humanity. And the responses to the required corrections of what has developed that are exposed by the understanding of the Climate Action Goal, or any of the other Sustainable Development Goals, expose inconvenient realities of the socioeconomic-political systems that people developed their preferences and ways of thinking in. A clear understanding to me is that Competition for perceptions of superiority relative to others brings out the Best or Worst in people. If people in the competition can get away with behaving worse (more harmfully) then the competition encourages the development of worse competitors (more misleading secretive harmful people - deniers) because that behaviour is an easier way to be a bigger winner. Without close monitoring and rapid effective correction things can be expected to devolve away from sustainable helpful improvements (like that entropy thing). What needs to be encouraged is the development of 'Passionate thoughtful helpful' people rather than the misleading marketing creation of 'Angry gut-reacting fearful' people. From that basis of understanding I agree with your concerns about the Psychology Today article. And I have some minor points to make regarding your points 1) and 2), and I would add some new points. Regarding your point 1): I believe that the awareness that needs to be raised is awareness of how easy it can be to keep people from improving their awareness and understanding. People can easily be kept from improving their awareness and understanding, be kept from changing their minds, if they have developed a personal liking/desire for an incorrect belief that leads to harmful results or the risk of harmful results. People can be easily tempted to like claims that defend their developed desire to not have to change their mind, or change how they act, or admit that their actions are harmful. Regarding your point 2): Leaders and followers are a matched set. A leader needs followers to remain a leader. I agree that getting better behaviour out of leaders is key to achieving the required corrections. The problem is how fickle the followers can be. Back to 1), many people can be easily tempted by deliberately misleading wanna-be-leaders. A Good Helpful solution is to have all competitors for leadership being dedicated to honestly improving awareness and understanding of the corrections required to sustainably improve the future for a robust diversity of humanity (based on the understanding that the only viable future for humanity is a robust diversity of humanity sustainably regionally fitting in to a robust diversity of life on this planet). That requires increasing the number of people who understand the need for that type of leadership. In addition, the climate change problem will not be solved by only the Good Helpful people changing what they do. The problem requires fairness, meaning everyone understanding what they have to do - No Free Riders allowed to believe and do as they please (PeterV included a version of this point in his Jan 11, 2019 comment on the SkS item “Discussing climate change on the net”). Allowing harmful beliefs and activity to persist uncorrected is very dangerous and damaging to the future of humanity. A key issue is the type of attitudes, ways of thinking about things, that the socioeconomic-political systems encourage people to develop. People act based on the way they think. Even gut-reacting is a way of thinking. It is thinking without well reasoned evaluation of the helpfulness/harmfulness of the thoughts and resulting actions. Constantly improving awareness and understanding (being more correct), to help develop sustainable improvements for others (being more helpful), should be the understood ideal for every member of humanity. And it should be the expected behaviour of all of the winners and leaders in socioeconomic-political competitions for popularity and profit. The more influential or wealthy a person is, the higher the requirements should be for them to behave correctly helpfully. Acting harmfully in spite of the ability to more correctly understand how to be helpful is the worst thing a person can do, especially a wealthy or influential person. A person who has the ability to correctly understand something but chooses to act harmfully in spite of their ability to be correctly helpful needs to be seen to be a very harmful type of person. And a person who claims to be doing something helpful but achieves that claimed helpfulness through a harmful action must not be given credit for that Good Thing they claim to have done. An example of 'understanding that Actually Doing Something Good does not justify compromising on helpfulness by doing some Bad to get the Good - the ends do not justify the means' is drug operation leader El Chapo. El Chapo is not a Good Person even though his leadership of the regionally popular and profitable activity provides significant assistance to very many poor people in Columbia. That Good does not excuse any of the harm done. The same goes for fossil fuel burning being excused because of perceptions of Good Results being observed in the world that has been dominated by the burning of fossil fuels (incorrectly attributing the Good that has happened to an understandably unsustainable and harmful activity). The need to find excuses for developed harmful preferences is a defence mechanism. It is being triggered by some very smart people who understand how to manipulate the thinking of people. They try to make people fearful. But the political ones also try to make people incorrectly angry enough to be sure to vote for the leadership contender who makes them incorrectly fearful and angry. And those very smart people have the ability to correctly understand the climate science. But they are willing to work for the interests of wealthy and powerful who can also understand climate science and the socioeconomic-political corrections that need to occur to limit the harm being done to future generations. Collectively they fight against corrections and limits to their freedom to harm others and future generations, because such corrections and limits are 'correctly perceived to be at their personal expense, their loss of perceived superiority and prosperity relative to others'. My understanding leads to another comment regarding the following Psychology Today article point "How easy it is to shut the bad news away and look to deal with more tractable problems. Even poverty, war, and famine seem more easily solved than climate change.". Without achieving the Climate Action Goal, any perceptions of success regarding any other Sustainable Development Goals will be unsustainable. The more rapidly the climate action goal is achieved and improved on the easier it will be to sustainably reduce poverty, war and famine. "My current developed understanding is that the Objective of human activity needs to be helping others." Some of the research posted recently supports this notion: "What affects individual energy conservation behavior: Personal habits, external conditions or values? An empirical study based on a survey of college students" The study found values and in particular altruistic thinking was the most significant factor leading to more energy conservation. Thanks for the link. Improving understanding relies on updates of information that alter or strengthen an existing understanding. One pore point. I am moving away from using the term Altruism. I have been learning that people have different perceptions of the term. And some of those perceptions are not consistent with my intent to focus on helping vs. harming others. Using the term can end up in misunderstanding. Some people, like Ayn Rand, have very extreme views of Altruism. They see a altruism as a complete abdication of all personal choice or freedom. Ayn thought that way because she considered the Authoritarian Soviet state actions to be examples of what altruism is all about. What was happening was not Ayn Rand's observation of a requirement of altruism from Soviet citizens. A portion of the Soviet population was abusing claims that sounded altruistic as misleading marketing for their authoritarian strongman pursuits of more personal power and perceptions of superiority relative to others. My current understanding is that Ayn Rand would likely have been a strong proponent of what I am thinking is required. One gap in her expression of her thinking was the failure to describe what she meant when she said things like it being 'best for every man to do as they please except that it was 'immoral' for a man to not be productive'. Productive is open to a range of helpful and harmful possibilities. It is possible that a person interested in being deliberately harmful (as I describe help vs harm) could be considered to be productive because they are doing something that impacts others and they are succeeding. Ayn Rand has said other things that indicate she expected people to be helpful rather than harmful. But she never seemed to clearly elaborate on the requirement for helpfulness. Tragically, an acolyte of Ayn's, Allan Greenspan, claimed in his testimony to Congress after the 2008 financial debacle he oversaw the development of, that he had no idea that business leaders would consider doing anything that would result in future harmful consequences. Many anti-altruism freedom fighters appear to similarly misunderstand what is actually going on. The mere mention of the term altruism can trigger a fear and anger gut-reaction that isn't helpful. Using the terms helpful and harmful still challenges their beliefs, but it is harder for them to be dismissive about a help/harm description than they can be about a term like Altruism. Some of them actually even try to claim that altruism does not exist, probably because they do not want it to exist, because the likes of Ayn Rand state that altruism and capitalism cannot co-exist, but more likely because the thought of giving up a potential personal benefit out of consideration for Others is seriously contrary to their interests. OPOF @19, I did a design degree, and Ayn Rands Fountainhead "came with the territory" and I also read Atlas Shrugged. I think you are right her views were very coloured by her experiences of the Soviet Union. She saw the worst side of socialism, a confused set of policies often forced onto people in barbaric and senseless ways at the point of a gun. Intellectuals rounded up and forced into labour camps. Anyone should be horrified, but it made her react against anything even remotely socialist, and means she was letting circumstances colour her evaluation of things, so although she claimed she was an objectivist, she was actually the complete opposite. Not that all her observations are wrong, but her ideology and her code of morality is little more than her opinion and doesn't make a lot of sense. For example its nice to say everyone should be productive. Who would disagree? Nobody sensible. But if someone gets lucky and wins the lottery and stops being productive there is nothing we can do about it short of forcing them, the very thing Ayn Rand would rebel against. And how do we deal with people who cannot be productive like invalids? Because it's really this that is her real, hidden concern. In Ayn Rands world they are left to the wolves, because she rules out any collective response where the public assist such people through something like a social security programme, because she sees this as the alleged mob telling her that she must help pay for such a scheme through taxation. She sees this as fundamentally wrong, having seen the worst consequences of such forced programmes in the soviet union, however the only viable way of funding such schemes is in fact taxation. The only viable way of funding any form of government action is taxation, so if taxation is "theft" then we cannot escape some element of theft, because the alternative is the rule of the jungle- and this is even worse than Soviet collectivism. So I say her world view is laughable and not logically thought through. In fact the real solution is to create socio economic structures that help people and tax as required, but structure them to minimise such structures abusing their power and over taxing and over spending.There are obvious ways of doing this. Yes sure I agree Rands acolytes try to give altruism a bad name. I'm in two minds, because I see your point of view, yet why should we let them dictate the terms of the debate? Altruism is a recognised form of human behaviour and a word in the dictionary. We do it because we are human, and I'm damned if anyone is going to tell me it's somehow fundamentally wrong or cannot form part of governments thinking! Even if we use the term Helpful they will finad a way to pull that to bits! Ayn Rands world might have purity of ideas, but it is a cold sterile purity and is unable to deal effectively with problems in the real world. The real world is complicated and messy. I do not believe in soviet union style collectivism as such, this sort of ownership just leads to stagnation, because nobody owns anything so nobody cares, but environmental problems fall into the category of "things needing some government input" because free markets simply dont adequately solve the problems. This might annoy Rand, but too bad for that. Ayn Rands thinking means such problems would go completely unsolved for the sake of her "principles" which is just madness. Thanks for the added insight into Ayn Rand. And I will continue using the term Altruism but will trying to remember to describe it as 'helping others with no expectation of any return benefit' and the related understanding 'not harming Others'. That is the essence of the motive for establishing and pursuing the Sustainable Development Goals. Most of the required actions and corrections should not be expected to return a direct benefit to those who put the effort into achieving and improving on them. The required actions are not a set of Trades in the Market between supposedly fully informed and equally influential parties. Gee, I would have said the attraction of Rand's confused philosphy was in how to feel good about being a completely self-centered, immoral prat. Followers really dont want to think too hard about how her idea connect actual reality, preferring to try and shape reality to fit Rand's fantasy worlds. Australia just recorded the warmest January ever, and where I live in NSW it was really really hot with max and min anomalies in the order of 4-8 degees Celcius above long term averages. Another less mentioned signature of the weather has been that dew points have likewise been way above average, and in western Sydney we've had daily temperatures exceeding 40 degrees combined with web bulb readings in the mid 20's. Typically, such high temperatures would be offset by a wet bulb reading in single figures. The combination of high temperature and high humidity put huge strain on power infrastructure, as everyone was compelled to use air conditioners as a means of survival. Australia actually has one of the highest uptakes of PV rooftop solar, which helped enormously, but with high temperatures after sundown it's also created a huge demand spike on the grids after 5pm. As a result there have been rolling power outages in Melbourne and Adelaide. If this summer is any guide to future climate norms then large pumped hydro and other storage solutions will need to be implemented asap if dependence on coal and gas fired power is to be reduced.